"Preserve and restore resilient tidal wetlands and associated marine and terrestrial habitats." For detailed information on Goal 1 objectives and management strategies, see the Goal 1 section of the Regional Strategy 2018. The RFP window for Work Plan projects focused on Goal 1 Objectives is now closed. Please see this page for information on when the next RFP will be released, and familiarize yourself with the application tool in the meantime. The roadmap for how and where to restore current and future wetland areas is provided in the restoration objectives below. Implementation of the objectives would include the continued management of existing wetlands, the restoration today of potential restorable areas, and the protection and enhancement of wetland-upland transition zones that may become tomorrow's wetlands. Protect what we have: Maintain the 8,600 acres of existing tidal wetlands through protection, restoration and enhancement measures. Actions include restoring tidal dynamics to areas that were wetlands in the past. Restore wetlands for the future: Facilitate the future restoration of 7,700 acres of tidal wetlands. Actions include facilitating wetland expansion into wetland-upland transition zones through protection and enhancement measures (this might require acquisition) and restoring tidal action to areas that could be wetlands in the future, including land that is currently developed such as parking lots and agricultural fields. Increase wetland size: Regain some of the large tidal wetlands that have been destroyed. Restoration needs to occur around the existing wetland perimeters and joining together existing fragments in order to recover the areas that have been lost. Click on the icons below for interactive maps showing historical, present day, and future wetland extent. A major shift in our approach to wetland recovery must be from protecting only areas that are currently wetland, to also protecting areas that are currently upland but will be wetland in the future. The upland edges of tidal wetlands provide unique habitats, refuge for marsh wildlife, access to food and other resources, and serve the crucial role of providing space for wetland expansion. But much of these wetland-upland transition zones have been lost to development. Without wetland expansion, sea-level rise will convert coastal wetlands into mudflats and subtidal habitats, altering the appearance and functions of wetlands as we know them, and placing additional sensitive infrastructure in the path of rising waters. 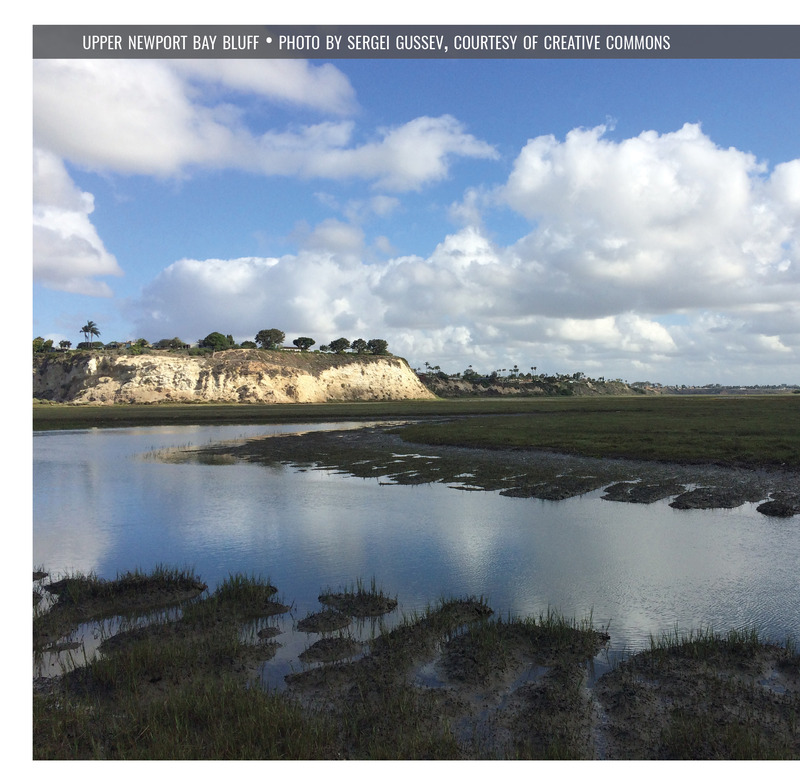 Protect transition zones for sea level rise: Protect all of our remaining wetland-upland transition zones, while also expanding these habitats to at least 40% of the wetland perimeter and up to 1,600 feet from the wetland edge. Sea-level rise will have particularly dramatic impacts to coastal wetlands because of the changes that we've already made to the way these ecosystems work. The construction of roads, bridges and levees have completely changed water and sediment flow, which are defining processes that support estuarine systems. Tidal creeks, channels and ocean inlets that were once dynamic and roamed across their floodplains have become fixed in place and stationary. Connections with the ocean have been diminished and altered. These alterations disrupt tidal processes and lead to changes in wetland habitats and the species that they support. Reconnect wetlands with watersheds and the ocean: High priority should be given to projects that remove barriers that disconnect coastal wetlands from the ocean and the watershed. Reconnecting wetlands with the ocean and rivers that supply water and sediment will allow recovery of lost wetland habitat. Restore connectivity for currently fragmented systems: Building roads, bridges and levees have severed wetlands and created small fragments from big coastal wetlands that once existed. The fragmentation that has occurred will impede the wetland's ability to expand and keep pace with sea-level rise. 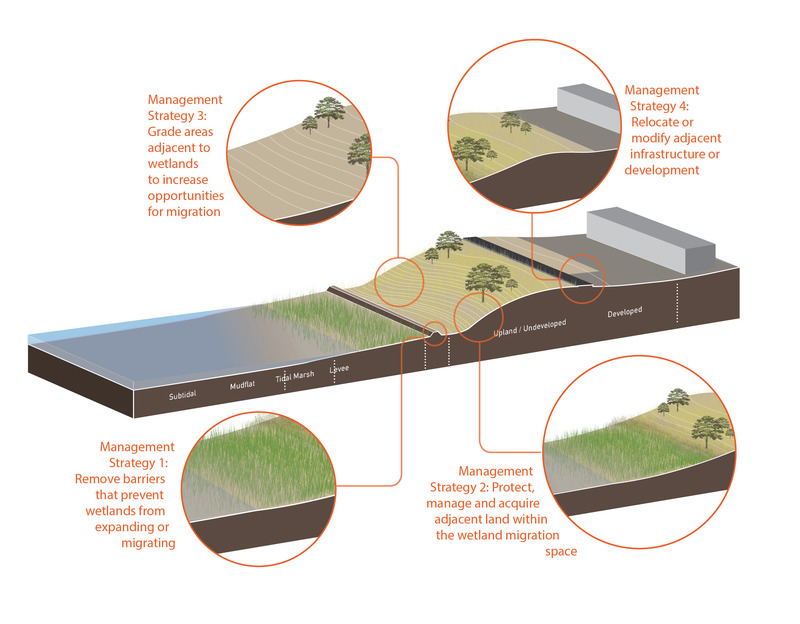 The recommended strategy is to reconnect wetland fragments into coherent systems by removing barriers that have been built in the wetlands (see Management Strategy 1, below) and by allowing natural processes to work without interventions and active management. Restore physical and hydrological processes: Tidal range and extent, which today is often muted, should be unimpeded to support appropriate habitat compositions. Water and sediment flow should be sufficient to maintain marsh elevation in the face of sea-level rise, because estuaries need sediment to sustain themselves. The ecological health and resilience of coastal wetlands is dependent upon the diversity and complexity of their habitats. There has been a particular loss of intertidal wetland habitats, such as marshes and flats. With these losses we have lost or diminished the unique functions that our coastal wetlands could provide, such as supporting the wildlife that we value. Maintain and restore the diversity of southern california wetland types (or "archetypes"): Each unique wetland type provides distinct functions that support the matrix of wetland ecosystems throughout the Region. Understanding the historical distribution of wetland types can help guide the restoration of wetland types that the landscape can support. Restore coastal wetland composition: The mix of intertidal and subtidal habitats has shifted dramatically as a result of human modification, while accelerated sea-level rise is likely to cause further conversion to deeper open water habitats. Efforts should be made to prioritize intertidal wetlands protection and restoration. Particular attention should be given to protecting existing salt flats and subtidal habitats associated with wetlands. The most recent sea-level rise projections suggest that the rate of sea-level rise will increase markedly after 2050, resulting in a near doubling of the rate by 2100 (Griggs et al. 2017). Considering that restoration can take up to 20 years after completion to achieve a fully functioning coastal wetland, restoration projects should be completed by 2030 in order to establish mature marshes by 2050 (figure below). If the ultimate aim is to establish resilient vegetated marshes by 2050, such planning needs to begin immediately to be realized within this time frame.